George Harrison was a huge advocate for the ukulele. He loved playing them, and even giving them away. On one trip to Hawaii I was told a story that George would go around the island and buy all the Kamaka’s he could find (now I don’t know if it was a certain size he was after, or if he just bought any and all), and he would then give them away. 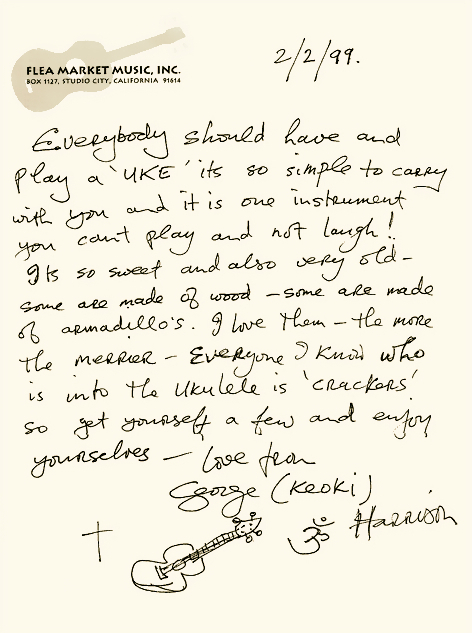 Below you’ll find a letter that George wrote on Flea Market Music letterhead about the ukulele as well as videos of George playing some of his Kamaka’s. This entry was posted on March 10, 2012 at 6:54 pm and is filed under History. You can follow any responses to this entry through the RSS 2.0 feed. You can leave a response, or trackback from your own site.